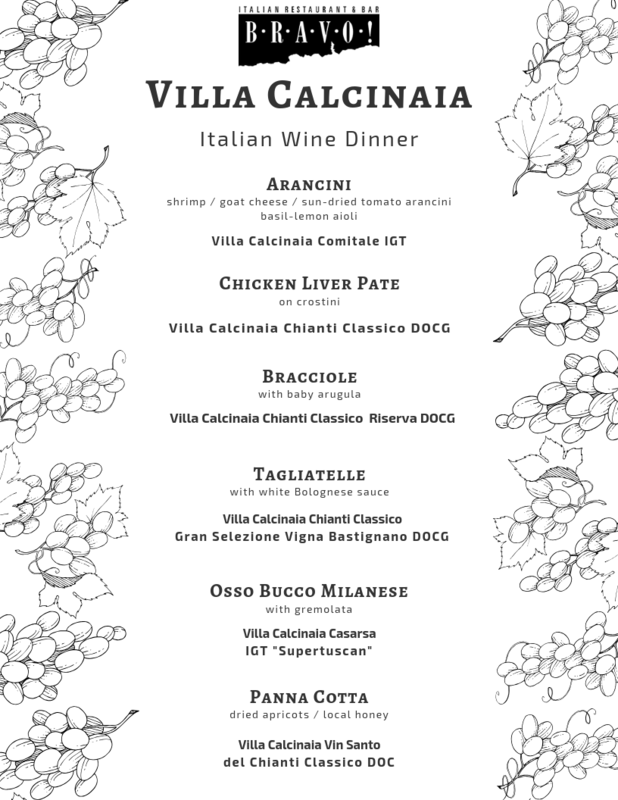 Villa Calcinaia Italian Wine Dinner | BRAVO! Come enjoy Italy one glass- and bite- at a time at this masterful dinner! Monday, February 25th at 6 PM join us for a BRAVO! masterpiece of a meal highlighting gems from the old world, both food and wine, at our Villa Calcinaia Italian Wine Dinner. With six courses and six of Villa Calcinaia’s best wines, this evening gives homage to familial pride and history. We will have a special guest, Sebastiano Capponi, a member of the winery family all the way from Italy, with us for the evening to discuss the history and unique flavors of each of the wines. Additionally, we will have fun exploring some of the more traditional dishes that Chef Dan loves to create for a true journey through the Italian palate! With six courses and six wines, tickets are $120 a person for this rare opportunity. Seats are limited, so reserve yours today!